The city of Bellinzona, Switzerland is perhaps best known for its trio of handsome medieval castles, inscribed on UNESCO’s World Heritage List since 2000. Yet, this historic city, which sits at the foot of the Alps, has more to offer than these impressive fortifications. Bellinzona also has an elegant Old Town district, a spot which we explored with our dear friend, Claudine, likely already known to you since she is the adoptive mother of our former Ukrainian foster kitten and 2014 travel buddy, Cocoa. As Shawn, Claudine and I waited to pick up Cocoa from the Swiss veterinarian following his neutering surgery (it would be our first time seeing Cocoa since we handed him over to his new family last autumn! ), we dodged tiny raindrops in Bellinzona on a August afternoon. The town is the capital of the Italian-speaking canton of Ticino. Knowing that I was ‘collecting windows’ for my collage series, animal-lover Claudine was quick to suggest that I photograph window #2 featuring a pair of pigeons perched atop it. 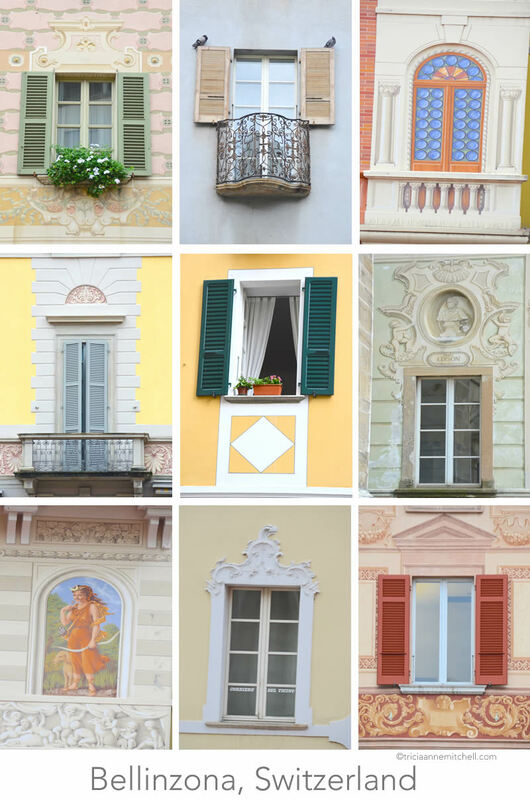 In the coming weeks, I’ll feature much more about our time in the Mediterranean paradise of Ticino, but in the meantime I wanted to share these eye-pleasing windows from Bellinzona. Can you spot which ones are examples of trompe-l’œil – optical illusions which trick a viewer’s eye into thinking they’re actually three-dimensional? Finally, because some of you have requested it, here’s a sneak peek of Cocoa via Facebook, and how he’s grown up to be such a handsome and healthy cat, thanks to his loving family. Darlene, we have more stories coming covering our time in Switzerland with Cocoa’s family, but I just started with this little appetizer. :) I’m glad you like the series. Thank you for your comment, and enjoy the week ahead! Tricia I like your point of interest everything is art. It reminds me of Romero and Juliet. “Everything is art” – I like that, Dlacson! Jenny, like you, I sometimes have window envy too. :) Perhaps frescoed orchids and palm trees on your villa (or whatever else is quintessentially Thai) might fit in? It made me smile to read that you’re now embarking on ‘window safaris’ too. :) Certainly, Bangkok’s wats have some stunning windows? I wasn’t ‘collecting windows’ the last time I was in Bangkok, but I do remember the temples’ elaborate architecture. Admittedly, I haven’t seen much more of the country – would love to return! These windows are so elegant. I would love to have something like this, but our windows are very large and it just wouldn’t be the same! I doubt it would suit our home but I will continue to enjoy seeing them on your photos! Loving the pale blue window which fronts onto the very tiny balcony as well as the two pigeons “decorating” the window on your second photo on top row. Bespoke Traveler, there is something very inviting about that lacy iron work! I do wonder how sound that delicate balcony is? Lucky Cocoa, got to travel far and find a forever-home. Interesting! The architecture of the window tells a lot about culture and history. So nice to see how diverse it can be. Ynah, as I look at the windows and the architecture, I often wonder about the craftspeople who created them, and the people who commissioned them to do so. From utilitarian windows to more elaborate ones, each was created by someone with a story. I see you’re from the Philippines. I hadn’t started my windows / collage series back when we visited in 2011, but I would like to return. The Batad Rice Terraces were one of our trip highlights. I would love to see your window collage featuring the Philippines! Alas, I wasn’t yet doing the windows series on the blog when we visited Manila, the Batad Rice Terraces, and Bohol back in 2011. Yet another excuse to return! Hi Kirsty, I can see why you’re drawn to that cheerful pair as well. It was grey and rainy the day we visited, so this vibrant architecture helped infuse a nice dose of color. Wishing you a splendid day in London; thank you for stopping by. Claudine “& the Band”, a more in-depth post featuring all of our Ticino adventures (and Prince Cocoa!) is on its way shortly. Putting together the video and blog post has been such a fun way to relive our lovely August days together. Hugs to you too! Nice photos! Seems to be a lovely town. Stephen, I would like to return and see Bellinzona’s castles bathed in sunlight someday, but the low-hanging clouds did add a certain mystique to them. Thank you for stopping by, and enjoy the week ahead! Enjoyed the window photos and am inspired to check them out. Have you done any similar studies on doors? Hi Vickie, while I’ve certainly marveled at many international doors and their brass hardware (even purchasing a traditional door knocker at a hardware store in Marrakech, Morocco), I can’t say that I’ve yet done a door collage. My husband and I have recently moved to Malta, where elaborate door knockers abound. Perhaps that will be my maiden collage. During your world travels, what particular destinations’ architecture have made an impression on you? Tricia, good question. By far the most captivating are the mosaic tiles on the exterior of Islamic madrassahs, misuse, ands mausoleums in Samarkand and Bokhara. They are fitting for the best of world architecture. You can see them in my 2014 posts from early September or do a search. I don’t know much about Malta, are there any Muslim influences there? If so, you might know what I mean. Vickie, I’ve seen a lot about Samarkand and Bokhara, and would someday like to visit Uzbekistan. How much time did you spend there? I have not been to Isfahan, but the architecture seems reminiscent of what you saw in Uzbekistan. As for Malta, we’ve so far been only attending to administrative tasks and not much sightseeing, but I cannot wait to get out and explore! The Maltese language is said to sound very much like Arabic (though written in a Latin script) and the architecture also has Arab influences (arabesques on churches, etc.) and many Maltese towns still have Arab names (Mdina, Rabat, etc.) It’s a fascinating island. Thanks for pointing me in the direction of your architectural posts! Hi Tricia, I just noticed that I had not responded to your questions until now! My apologies. I spent a week in Uzbekistan with a private driver and guide, and found this very efficient. Three days in each would be sufficient, but I spent only two in each. I am interested in going to Isfahan to see the royal Islamic architecture there, but hope that these magical cities represented some of the best in their own way. Especially as they are UNESCO world sites, I felt that they were a good introduction to the treasures of this lost period. I can imagine that there are many reminiscent aspects of Islamic culture in Malta, and to trace them would be fascinating. Thanks for providing these additional details about your journey, Vickie. I’m definitely eager to explore more of Malta’s cultural & historical sites, of which there are many. Small balconies always have a bit of the romantic feel to them, great shots! I’m always elated to hear when fur babies find a forever home! Wish I had one of those windows in my house. They are so cute! Roos, I can appreciate that! :) Someday, when we have a ‘forever home’ I can imagine cobbling together all the architectural elements of places which we’ve greatly enjoyed. A Bellinzona window or two would be a great addition.